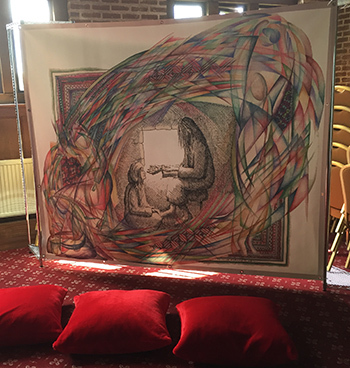 In 2015 we were invited to create a sacred space at the Retreat Association's National Conference and as part of that we took the Hold The Moment exhibition and added to the existing interactives. This is one of the new items produced for the Conference. This piece is called 'Stillpoint', and is a picture depicting Mary and Jesus whilst Martha rushes around. Visitors were invited to sit on scatter cushions. The activity wording was "Sit a while. Don't be like Martha, rushing here, rushing there, thoughts everywhere. Be at peace. Sit and listen. Let God talk to you. Be at peace." This item is 240CM X 200CM (2.4 X 2 meter) and is printed on 550gsm PVC. It can be supplied flat with no finishing, with eyelets at the corner, with pole loops top/bottom and hemmed if required.